Faxon Firearms, incessant innovators in the firearms industry, is pleased to announce the release of the STREAMLINE CARBON series of handguards for the AR-15. The STREAMLINE CARBON series of carbon fiber handguards melds extreme lightweight and functionality into a single rugged, easy-to-install M-LOK handguard. Mounted to a weapon, the shooter will see a dramatic increase in maneuverability and swing ability of their rifle compared to legacy metal options. The STEAMLINE CARBON fuses Faxon’s patent-pending mounting architecture and quality machining with Lancer Systems carbon-fiber know-how. The rails mount to the AR-15 using the common mil-spec AR-15 barrel nut, ensuring anyone with standard tools can mount the rail quickly and easily. When mounted correctly, the rail is locked in to position across all three axis, ensuring rigged and rugged performance under the most demanding circumstances. The 15″ rail clocks in at less than 8 ounces in its standard configuration including all mounting hardware. An optional titanium barrel nut reduces weight further by ~.8 ounces. The rails feature full-length Magpul M-LOK across all 8 faces of the octagonal handguard. Using an optional low-profile M-LOK rail, shooters have the option of mounting on-plane BUIS. Overall size balances a slim profile (OD is 2.05″) while being able to fit suppressors up to 1.6″ diameter. The STREAMLINE CARBON handguard will launch at Rainier Arms in a 15″ configuration. 13.3″ and 10.2″ lengths are in-production and will be available Q1/Q2 2017. The 13.3″ is the ideal companion for pinned and welded 14.5″ barrels, giving just enough space for the hand to extend all the way to the end without being concussed by muzzle devices. Retail for the carbon-fiber rails is set at $349, $339, and $329, respectively. Extreme lightweight without sacrificing strength, rigidity, or practicality. M-LOK attachment across 8 facets. Dramatically increases maneuverability of the weapon over legacy metal rails. Low heat transfer for handling xtreme duty cycles. Attaches with standard armorer’s wrenches and tools. 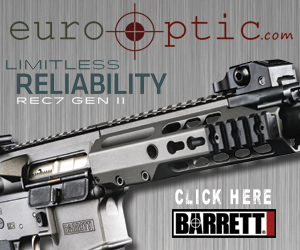 *Requires optional low-profile M-LOK rail adapters. About Faxon Firearms: Faxon Firearms is a leader in constant evolution in the firearms marketplace. Faxon focuses on US-made quality and innovation. From the ARAK platform, GUNNER & FLAME barrels, upper receivers, and an ever-expanding portfolio of innovating accessories, Faxon offers quality complete rifle systems and components. New dealers and OEM accounts are welcome. Stop by booth 7110 at SHOT Show to see the STREAMLINE CARBON Handguards, SLIM devices, SLIM barrels, and Faxon’s other new products. About Lancer Systems: Lancer Systems is an engineering-driven company. Their goal is to provide total engineered solutions; applications assessment, component design & development, validation and manufacturing. Lancer Systems aim to fill capability gaps for the military, law enforcement agencies, OEMs and end users across the defense, oil and gas, and aerospace industries. Lancer’s facility has a Type-07 Federal Firearms License as well as an SOT allowing them to manufacture firearms as well as NFA items. Lancer Systems designs, develops and tests all advanced weapons and components in-house. Lancer Systems is well known for their L5AWM and L7AWM ultimate hybrid magazines for military self-loading type rifles. Faxon Firearms is pleased to announce the release of two new SLIM muzzle devices, a 3-port muzzle brake and a tri-prong flash hider. The new SLIM devices are machined to a .620″ outer diameter, making them the perfect companion for pencil, GUNNER, and similar barrel profiles. SLIM muzzle devices are manufactured from gun-barrel quality steel and QPQ Nitride coated for durability and longevity. When installed, the SLIM series muzzle devices match the threaded shoulder, maintaining the thin profile of the host barrel. Further, they allow the user to mount and remove the gas block without having to remove the muzzle device, allowing shooters to reconfigure their rifles without having to visit a gunsmith. Retail for the muzzle devices is set at $59.99, including the mounting/timing kit. Retail for the SLIM equipped barrels is between $249 for GUNNER profiles and $259 for pencil profiles. The first SLIM equipped barrels with brakes have shipped to dealers including Right to Bear, Brownells, AIM Surplus, and others. SLIM flash hider equipped barrels will be shipping mid Q1 with the individual muzzle devices being offered as stand-alone products as soon as possible. Stop by booth 7110 at SHOT Show to see the SLIM devices, SLIM barrels, and Faxon’s other new products. Faxon Firearms has expanded their line of products over the past year far beyond just the ARAK-21 and ARAK-31. Check out the video below for coverage information from Bob Faxon.